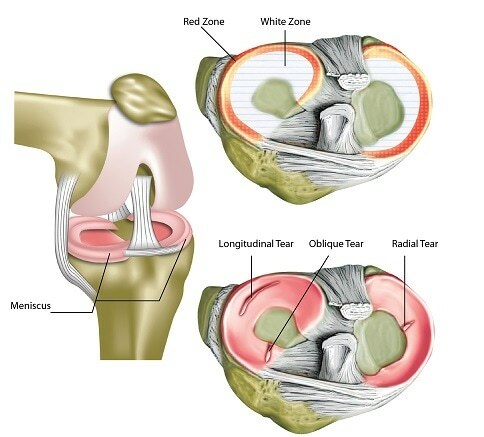 The meniscal tear, which is usually due to excessive force applied to the thighbone and shinbone, is one of the most common injuries of the knee, with an incidence rate of 2 per 1,000 patients per year in Netherlands, and accounting for 25,000 hospital admissions per year in England and Wales. Despite its relevance, there is little epidemiologic studies available on the prevalence of meniscal injury. A review that evaluated the prevalence of meniscal damage in asymptomatic athletes found that 31.1% of the athletes had meniscal damage, of which 3.9% were tears. Surprisingly, athletes in non-pivoting sports were found to have a higher prevalence of meniscal tears (5.4%) than those in pivoting sports (2.5%). Another study found that 79 young athletes out of a total population of 9,086 had meniscal tears in a stable knee. Historically, the menisci found in the knee joint were thought to be without function and therefore were excised in a meniscectomy. Fairbank, however, reported that this procedure was associated with development of premature joint degeneration, which led to complications such as joint space narrowing and osteophytosis. Today, the menisci are known to be crucial in distributing stress across the knee during load bearing, providing shock absorption, acting as joint stabilizers, preventing hyperextension, facilitating joint gliding and protecting the bone extremities. The top portions of the meniscus are concave, allowing them to conform to the convex femoral condyles, which are outer protrusions present at the lower end of the thighbone that forms the knee joint. The bottom portions of the meniscus are flat, allowing them to conform to the shape of the head of the shinbone. The anterior and posterior horns attach to the intercondylar eminence of the tibia, which is a protrusion in the center of the shin bone, using ligaments. The peripheral regions of the menisci are attached to the shinbone by coronary ligaments, while the lateral meniscus is attached to the thighbone by anterior and posterior ligaments called ligament of Humphrey and ligament of Wrisberg respectively. The medial meniscus is connected to the medial collateral ligament, which is a static stabilizing ligament of the knee joint found on the medial side of the knee and attaches (slightly posteriorly) to the thighbone and shinbone. These stabilizing ligamentous connections prevent the menisci from being pushed out during compression. Finally, it is important to note that only 10-25% of the periphery of the lateral meniscus and 10-30% of the medial meniscus benefit from blood supply from the arteries present in the area, while the central region does not have a blood supply. These two regions on the menisci are referred to as red and white zones respectively. This has major implications on healing capabilities; surgical repair can be done for injuries in the red zone, but rarely for injuries in the white zone (see the “Treatment” section below). Instead, for the white zone, the damaged section is removed in a meniscectomy. Oblique tears – these are similar to the vertical radical tear but at a different angle than 90 degrees to the circumferential fibres. Vertical tears are more common in general, but horizontal tears are more common in the elderly. The type of tear and where they occur determines the symptoms, healing potential, and ease of repair. In the young population and in athletes, acute meniscal tears tend to occur due to excessive twisting on a slightly bent knee. It may also occur from degeneration as found in the elderly population. For acute injuries, sports such as football and rugby have been noted to be high-risk sports, while swimming is a moderate-risk activity and running is a low-risk activity. For degenerative meniscal tears, age, gender (male), work-related kneeling and squatting have been found to be risk factors. There may be focal joint effusion and tenderness. True locking, where the knee cannot bend or straighten, is less common and indicates a complete vertical longitudinal tear, commonly called a “bucket handle” tear, which can twist completely in the joint. For physical examinations, palpation and inspection of the affected area, as well as special tests in cases of suspected meniscal tears, are usually done. MRI is the best option for diagnosis but is expensive, limited in quality and somewhat dependent on the expertise of the interpreter. Plain radiography is of little value as they cannot show meniscal tears, but can be used to eliminate the possibility of other injuries. Several factors are taken into consideration when deciding on a treatment plan for meniscal tears, but patient preference is usually central to the decision making. In cases of the bucket-handle tear, however, surgical treatment is encouraged as patients may not realize the dangers of delaying treatment. The patient’s age is also a major factor in deciding a surgical technique; for some clinicians, patients over the age of 50 years are ideal candidates for partial meniscectomy, whereas for other clinicians, or person over 30 years should be considered. It should be noted, however, that even though partial meniscectomy can delay degeneration and development of arthritis in the short term, it doesn’t prevent its inevitability. Educating the patient on treatment options, pros and cons, and ways to prevent re-injury is important for the recovery process. Non-surgical treatment is important, regardless of whether surgery is considered. Patients with no loss of joint function, minimal pain and swelling and a willingness to reduce physical activities respond well to non-surgical treatment. The RICE (Rest, Ice, Compression, and Elevation) regiment is usually recommended, and non-steroidal anti-inflammatory drugs (NSAIDs), or paracetamol if NSAIDs are poorly tolerated or contraindicated, often prescribed for 8-12 weeks. Physiotherapy has been found to be useful for recovery. The location and type of tear are crucial determinants in whether or not surgical repair will be attempted. Vertical longitudinal tears are usually ideal for repair since there is minimal disruption in the circumferential fibres. In the special case of the bucket-handle tear, however, stray circumferential fibres may inhibit healing. For radial tears, meniscectomy is the better surgical option. As mentioned in the introduction section, there are two main zones present in the menisci based on their proximity to the surrounding arteries: the red zone and the white zone. There is also a middle zone, called the red-white zone which shares characteristics of the two aforementioned zones. Since the red zone benefits from a blood supply, it has excellent healing potential. The red-white zone, being at the border of vascular supply, has good healing potential. The white zone, however, has very poor healing potential. In these cases, damaged sections are removed in a partial meniscectomy instead. Shiraev, T., Anderson, S. E., and Hope, N. (2012) Meniscal tear – presentation, diagnosis and management, Aust Fam Physician 41, 182-187. Jones, J. C., Burks, R., Owens, B. D., Sturdivant, R. X., Svoboda, S. J., and Cameron, K. L. (2012) Incidence and risk factors associated with meniscal injuries among active-duty US military service members, J Athl Train 47, 67-73. Snoeker, B. A., Bakker, E. W., Kegel, C. A., and Lucas, C. (2013) Risk factors for meniscal tears: a systematic review including meta-analysis, J Orthop Sports Phys Ther 43, 352-367. Yeh, P. C., Starkey, C., Lombardo, S., Vitti, G., and Kharrazi, F. D. (2012) Epidemiology of isolated meniscal injury and its effect on performance in athletes from the National Basketball Association, Am J Sports Med 40, 589-594. Bernstein, J. (2010) In brief: meniscal tears, Clin Orthop Relat Res 468, 1190-1192. Brindle, T., Nyland, J., and Johnson, D. L. (2001) The meniscus: review of basic principles with application to surgery and rehabilitation, J Athl Train 36, 160-169. Mordecai, S. C., Al-Hadithy, N., Ware, H. E., and Gupte, C. M. (2014) Treatment of meniscal tears: An evidence based approach, World J Orthop 5, 233-241.